Also making the rounds: Eric Roth will receive an honorary award at the Austin Film Festival, the latest doc from the filmmakers behind Sweetgrass and Foreign Parts makes a deal, and the Sylvester Stallone-Arnold Schwarzenegger vehicle The Tomb gets a 2013 release date. 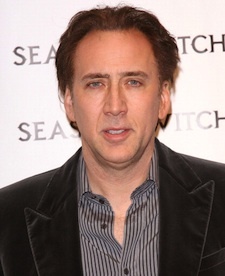 David Gordon Green And Nicolas Cage: Two Great Tastes? THR reports that Nic Cage will star as an ex-con and mentor to a teenage boy in a gritty Southern-set adaptation of Larry Brown's novel Joe. The versatile David Gordon Green (All The Real Girls, George Washington, Pineapple Express, The Sitter) will direct, either reining in or letting Cage's signature nouveau shamanic acting method run free. The documentary by directors Lucien Castaing-Taylor (Sweetgrass) and Véréna Paravel (Foreign Parts) will be distributed in the U.S. by Cinema Guild after screening next week at the Toronto Film Festival and subsequently at the New York Film Festival. The experimental documentary about fishing "captures the collaborative clash of man, nature, and machine. Shot on a dozen cameras — tossed and tethered, passed from fisherman to filmmaker — it is a cosmic portrait of one of mankind’s oldest endeavors." The annual event, held October 18-25 in Austin, TX, will award the Forrest Gump and Curious Case of Benjamin Button screenwriter with the Distinguished Screenwriter Award. The Oscar-winner will also take part in "A Conversation with Eric Roth," along with a retrospective of his work and screening of 1999's The Insider. America's most beloved critic announced via Twitter that he'll be getting his own (much deserved) documentary, with a trio of heavy hitters behind the camera: Hoop Dreams director Steve James, writer Steven Zaillian, and executive producer Martin Scorsese will join forces on the adaptation of Ebert's memoir Life Itself. "Whatever they do I will be fascinated," Ebert wrote to Indiewire. The Expendables and Planet Hollywood buddies will hit theaters in their own team-up, The Tomb, which will now be released on September 27, 2013 via Lionsgate, reports THR. ----CAN Scorsese be ANY staler?